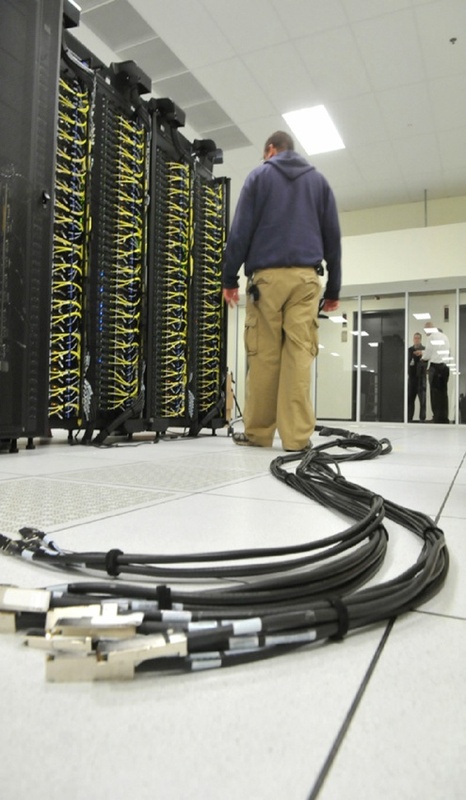 The ALCF’s data storage system is used to retain the data generated by simulations and visualizations. Disk storage provides intermediate-term storage for active projects, offering a means to access, analyze, and share simulation results. Tape storage is used to archive data from completed projects. Mira, Cetus, and Cooley, all mount these file systems avoiding the need to copy files from one file system to another for different purposes. Projects are mapped to the file system that best matches their storage and performance needs. Tape Storage: ALCF computing resources share three 10,000-slot libraries using LTO6 tape technology. The LTO tape drives have built-in hardware compression with compression ratios typically between 1.25:1 and 2:1, depending on the data, giving an effective capacity of ~65PB. Networking is the fabric that ties all of the ALCF’s computing systems together. The Blue Gene/Q systems have an internal proprietary network for communicating between nodes. InfiniBand enables communication between the I/O nodes and the storage system. Ethernet is used for external user access, and for maintenance and management of the systems. The ALCF’s Blue Gene/Q systems connect to other research institutions using a total of 100 Gb/s of public network connectivity. Scientists can transfer datasets to and from other institutions over fast research networks such as the Energy Science Network (ESnet) and Internet2.